The first year students at Augsburg College soon realize that the City and citizenship remain a distinctive focus of an Augsburg education. 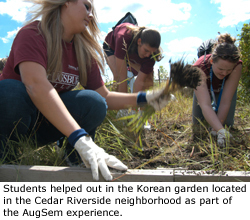 After being welcomed to Augsburg College during an Opening Celebration, rather than head to the classroom, the students set out throughout the community to various Service Project sites. Some students helped out in the Korean garden located in the Cedar Riverside neighborhood, some went to the Seward Montessori School where they helped kindergarten and other children on their first day of school, while others learned about the Campus Kitchen Program right on the Augsburg College campus. More than 300 college freshman participated in this annual event.